• $75 billion per year in lost productivity and foregone supply chain improvements that could be enabled by faster, more reliable mobility of people and goods. Like the young man who keeps getting dumped, the body politic is slow to learn. But dealing with these unintended consequences is what defines civilisation. Of the effects above, I believe traffic delays are most likely to spark change in personal transport. 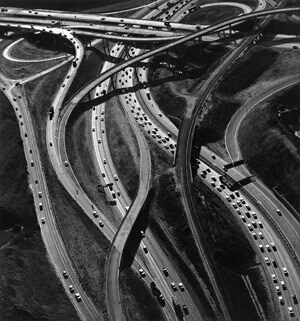 The history of transport, from the laying of Roman Roads, via the invention of the p-far, to the proliferation of freeways has been a race to improve travel speeds (or maintain them in the face of traffic snarls). Some proposed solutions to speed up traffic are grand engineering marvels! But a new technology needs space to start off. Cars got their start on streets, mingling with bikes, horses and foot traffic. They didn’t need special infrastructure to get started, only once they hit plague proportions. Compare this to the internet. It started off as small Defence department system, then became a global necessity without a fight. How? It wasn’t that there weren’t competitors for its services (ask a TV channel, record company or newspaper). It was that nobody was using ‘cyberspace’ before the internet came along. It could expand without treading on any toes. Just like radio, TV, and cell phones (barring some spectrum issues). And while there were network effects , the major cost of the internet was in the portals, not the connections. i.e. computers cost more than optical fibre. So the bulk of the cost of building the network fell on the consumer. What’s the implication for the future car? A successful replacement car will probably not need a heap of dedicated infrastructure. New technology can’t just be a good idea. It also needs a growth path – an unobstructed route to fruition. A new transport technology will require space on the roads during its nascent phase. And as anyone who’s been in a traffic jam knows, road space is at a premium. The need for experimentation space is addressed by uber-urban-blogger Ryan Avent here. If his call for special experimental-car-lanes seems pie in the sky, then you can see why any new technology will have to fit in, or be able to create its own space. A future car also needs to manage its financial risks. Many solutions, like plug-in cars, rely on network effects, and will deliver great benefits if everyone uses them. But a big system may be too expensive for any private company, and too risky for any government. So a future car that catches on is likely to be one that delivers benefits to its owner in that slow growth phase, and even if the majority of the population doesn’t take it up. In coming days, this series will consider a few future prospects for personal travel. It will try to be hard-headed about the prospects of each. Will the car go the way of the horse? Can we imagine a world where a car is a luxurious excess? Where an enthusiast has to operate it only on select rural roads and pay for special stabling ? Where kids put posters of cars all over their walls and their parents breathe a sigh of relief when they grow up, get real and get over it?! Interesting post. I find it kind of creepy that with all the figures you quote bicycle registration and usage charges get such a regular run in the media. I’ve gotten over the car already. I still pay rego on it but it only gets used for necessities, not for daily commuting. On the rare occasion I do need to use it to drive to work it’s a joyless and frustrating drive. Why do so many people do it everyday? I would rather ride in the rain. I grew up pretty obsessed with cars and I spent quite a bit of my childhood marvelling at beautiful and exotic cars. Life turned out differently and I didn’t end up getting a car until my first child was nearly 2 and more than a decade after I got my license. It didn’t resemble any of the cars I dreamed of getting. It was 10 years old and chosen for it’s cheapness and easy maintenance. I expect that this will be my first and last petrol powered car. Oh, the automobile stepped on a few toes. Not in terms of physical space, mind you, but in government subsidies for roads (starting with 1 billion $ in 1920), while the earlier private interurban systems still paid taxes, and were eradicated by the 1940’s because of it. 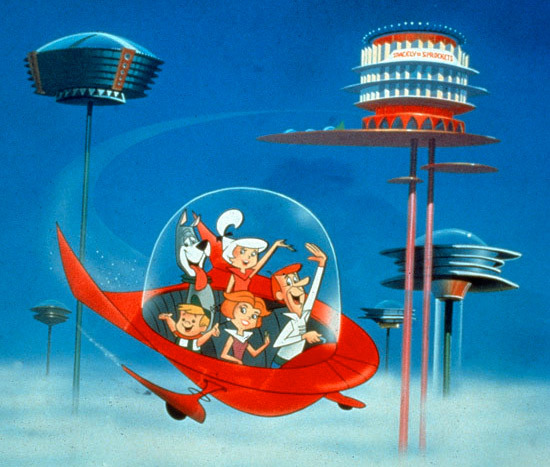 But, the future of personal transport- I’m going to say it’s going to look alot like the car. Back in the 1960’s, they did simulations with the ‘George Jetson’ ideal, and found out that there would be so many daily mid-air collisions, that it would turn any city into a warzone. There have been many talking heads favoring the automated freeways idea, and there were many supporters for that back in the 90’s, but now, thankfully, the US is re-investing in public transportation. The ideal: energy prices skyrocket (get realistic), and populations densify enough to make public transportation viable, for most in cities, allowing for personal transportation to actually look like car ads, where the machine is free of burden, racing alone in the countryside on some romantic windy road… I mean, can we really improve on that ideal? What will most likely happen: Some infernally efficient car will pop up within the next ten years or so for the status quo to continue, albeit with some augmented public options as well. Previous Previous post: Whoop! Whoop! Go Cadel, but can you work on your salute? Next Next post: Car Future Part II – Robot Cars.